A peek behind the scenes at Les Crouquets holiday cottages & life in rural France ! We don’t often hold “group” evenings – with only 7 gîtes it seems to work best if they just happen naturally when “la mayonnaise prend”, as they say in French! The men are feeling the heat! Last week 4 of the 7 families have been before and everyone was getting on famously so a big communal BBQ was arranged at the beginning of the week. It also happened to be someone’s significant birthday so it was a good excuse for some celebratory bubbly too! 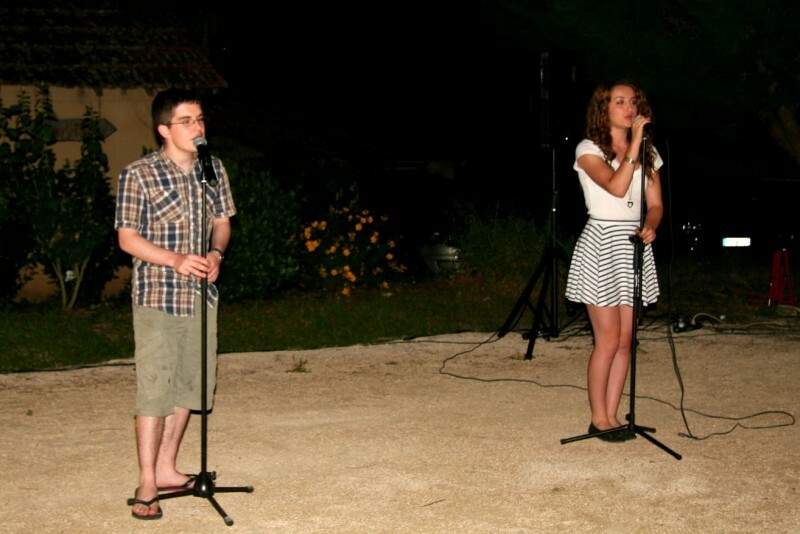 Tom Wyllie is a regular guest at Les Crouquets and when he was last here in 2011 he sang for our guests, delighting everyone with his rich baritone voice. Since then he has launched his singing career and has recorded 2 albums. As luck would have it he is here again this week & he agreed to entertain the troops! What a fantastc job he did, rallying everyone around in great party style singing everything from Copa Cabana (while leading a snaking conga all around the gardens) to a brilliant rendition of Nessun Dorma. Classical music is Tom’s forté and he sings these impressive arias exceptionally well! Emma is also just beginning to dip her toes in the singing waters and she joined forces with Tom for a couple of duets as well as several well received numbers on her own. 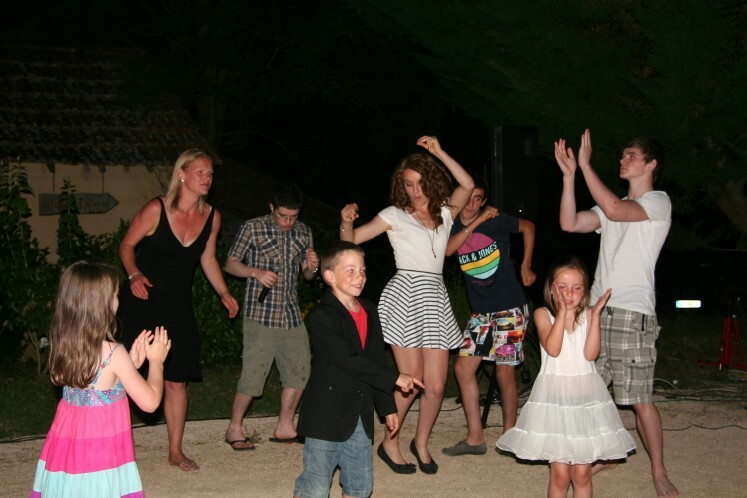 Ed (Tom’s brother ) and Alistair manned the mixing deck…theWyllies and the Djelils – 4veryproudparents.com!! A huge thanks to all of our guests too – children & adults alike, they all joined in in some way and helped make the evening a great success! The boules pitch is turned into a dance floor! Very much looking forward to the next time the mayonnaise takes…!! This entry was posted in Uncategorized by Les Crouquets. Bookmark the permalink. that looks like great fun, Elena!! what a memorable holiday for your guests. No wonder they come back again! It is great fun Elisa! 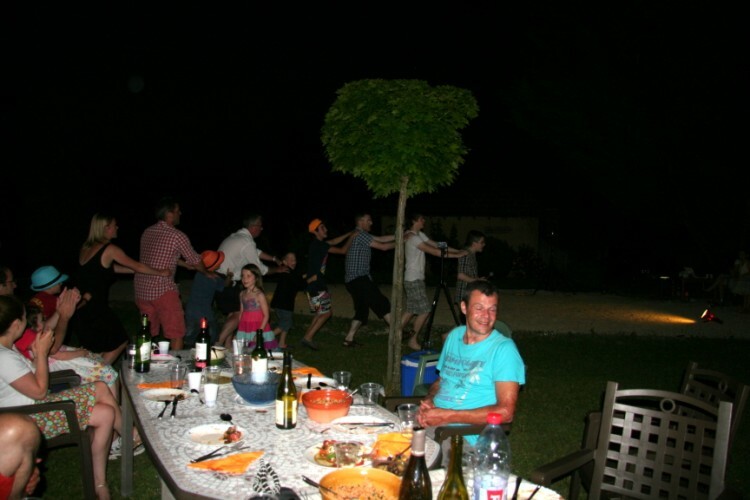 This time the boules pitch became a dance floor but we have been known to have boules competitions which last well into the night and there is the threat of an impending golf tournament this Summer which will no doubt end in an impromptu BBQ! I’m not keen on “organised” events and just love the spontinaity of it all!! 🙂 Well 7 gites isn’t that many compared to much larger complexes where sheer numbers would almost guarantee enough people would gel together to make it a success! It’s a lot of work but well worth it when everyone, including us, has a great time!